A fortune one hundred soy bean processing company had a need to reduce white soy flake to several specifically sized powders. They contacted Prater to discuss the possibility of being able to provide a compact package that offered the high throughput rates necessary to accomplish the job. This customer had previously purchased a competitor’s system but after installing the equipment, found that it was not capable of producing the desired results. The soy flake that needed to be ground into a fine powder is very fibrous. Grinding fibrous materials is difficult because the fibers tend to bend instead of reducing in size with impact. Once the material had been reduced, the customer wanted the powder classified to various sizes for different client required uses. Prater’s “M” Series Fine Grinder allowed the customer to grind white soy flake down to less than 300 mesh with extremely tight particle distribution. Advanced technology and fine tuned processing, made it the ideal solution. The “M” Series Fine Grinder allowed the client to grind to varying levels of fineness in a single pass, requiring only a minor process change. This processing advancement provided the customer the ultimate in flexibility to meet the demands of their client base. The customer sent their material to our testing and tolling lab in Bolingbrook, Illinois, where we processed the material to the customer’s requirements. Prater engineered a grinding system capable of delivering each required particle size in a single pass, increasing processing efficiency. Samples of all the different size requirements were evaluated and capacity requirements where met. 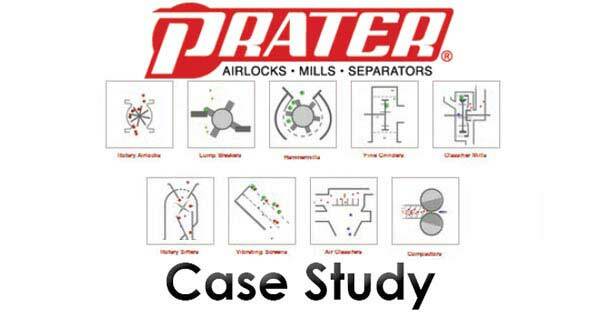 The customer promptly purchased a complete system which was delivered in their time frame and started up on time and on budget by the Prater Team.